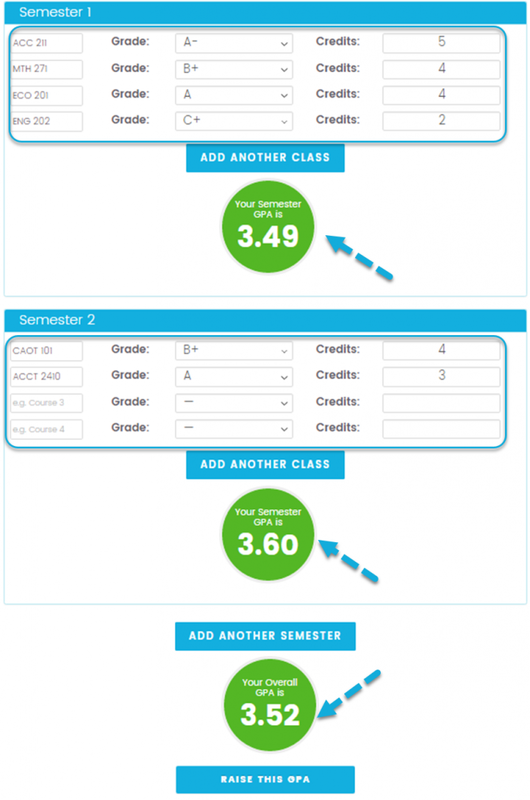 Want to calculate your college course grades? Our easy to use college GPA calculator will help you calculate your GPA and stay on top of your study grades in just minutes! Whether you are taking degree courses online or are on a community college campus, no matter what degree course or specialized study you are aiming for – we’ve got you covered. Try our simple to use grade calculator to calculate your course grade assessment and final test grades. 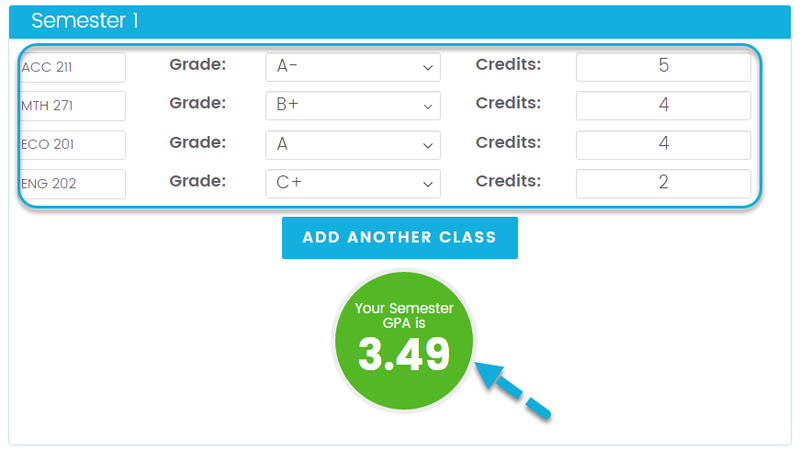 You can select your current letter grade or experiment with a grade estimate to figure out your GPA. To get your grade, you can ask your teacher, as most are happy to give you your grade before the final report card. However, for the grades you cannot confirm, you can estimate and choose a grade. Grades can range from A+ to an F on the 4.0 Scale. For each class, choose a letter grade from the drop-down menu. Enter the grade and earned credit for each class. For example, if you have earned A for a 4 credit class, then enter 4 in the box next to the â€œA.â€ You can add both weighted and unweighted high school classes. Your weighted classes receive extra points on the GPA scale. Unweighted classes are regular and do not carry any extra points. Continue to enter counts of all your grades earned in coursework. Your â€œSemester GPAâ€ is calculated and shown above â€œAdd another classâ€ button. Your GPA will be calculated for all the subjects and grades you enter. Itâ€™s alright if you have fewer than 5 classes to enter. If you have more than 5 classes, you can click the â€œAdd another classâ€ button as many times as you need. Add â€œAdd another semesterâ€ button if you need to add more semester. Your â€œOverall GPAâ€ for all semesters is calculated and shown at the bottom of the class list below â€œAdd another semesterâ€ button â€“ itâ€™s that easy! The semester GPA and aggregate cumulative GPA will keep updating at the bottom of the page as you keep adding letter grade and class weight. You can add multiple semesters to figure out aggregate and per semester weighted GPA. Follow these steps and youâ€™re well on your way to creating your very own report card! Q: How do I calculate AP or Honors courses? A: When taking AP (advanced placement) or honors courses, grade points are generally weighted. For example, a half point (.50) is added for honors courses, and a whole point (1.0) is added for AP courses (A then equals 4.50 for an Honors class, or 5.00 for an Advanced Placement class). Contact your college for more information on their grading system as schools may differ when assigning point value. Q:DI have a very low GPA. How do I improve my GPA? A:You can use this simple online tool to figure out what GPA will you need in the final to improve your GPA. Q:How can I calcualte my grades?A:Use our grade calculator to calculate your study grades.